Hospitals require the utmost standards of hygiene and cleanliness but design in hospitals stretches beyond increasing hygiene. Matters of efficiency, cost and speed are all key concerns when designing any part of a modern hospital. These are of particular concern when you consider tightening budgets and an overburdened healthcare sector. We’ve broken down the design requirements for hospital swing doors into 5 crucial segments for your consideration. The weight of doors is completely ignored in most applications, such as around your home and in officespaces. This is not the case with hospital traffic doors; in fact it isn’t uncommon to hear thermal traffic doors referred to as crash doors due to the punishment they are subjected to. The three major factors that make weight an important consideration for hospital door design are the frequency of people travelling through the door, the speed at which they are travelling and the way that they open the door. 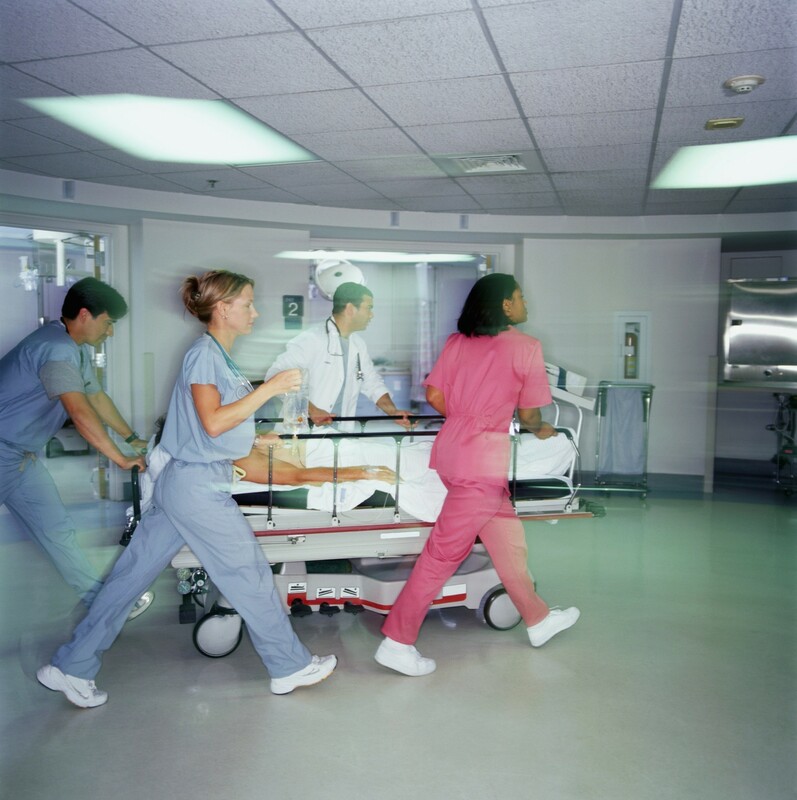 A hospital Emergency Department would have high frequency, high speed traffic, day and night; and all doors need to open quickly but still be durable enough to take repeated impact. There is however a more crucial factor; the way people navigate through doors. In a lot of cases; when nurses are wheeling beds, wheel chairs and trolleys through hospital doors, they travel backwards using their shoulder, heel or backside to push through the door. Even when travelling forward; opening a heavy door while also pushing, towing or carrying an item can be very difficult. This is something Equipment Manager, Troy, at St John of God, Ballarat Hospital identified as a major issue for his workplace. Strain injury was becoming a major concern at Ballarat hospital with their old, heavy timber doors. Troy even goes on to say that “there was a possibility we would have to decommission suites.” This shows how what may seem a minor concern can become a massive roadblock to the effectiveness of the hospital. Luckily, timber doors are no longer the only option. New technology has allowed doorway and barrier companies to create one-piece polymer doors with high-density foam cores; offering a lightweight, strong, insulating and durable alternative. Some polymer doors are even ultra high pressure filled offering a density comparable to that of a timber door with an added, impressive thermal R-value of 3. This means that the polymer door can help save on air conditioning and heating bills throughout the hospital, on top of increasing efficiency and safety. 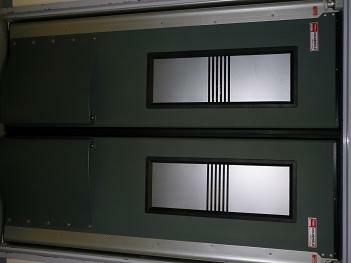 But polymer doors offer another significant advantage for hospitals, which is the added benefit for hygiene. Polymer panels have no gaps or joins and are impervious to moisture and acid petroleum products. 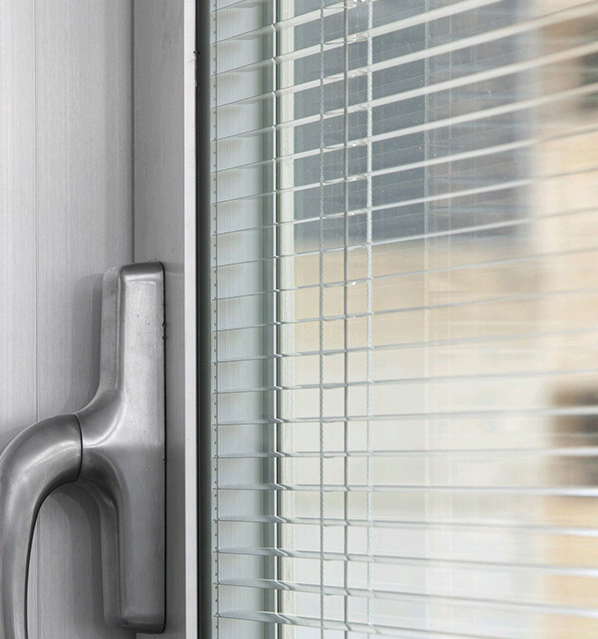 This is crucial in a hospital where any chip in a timber door can create a harbourage for undesirable pathogens, and as we know, Surgical Site Infections (SSIs) are the second most common site of health care associated infections (HAIs)*. There are several steps that have to be connected to result in infection, however, for SSIs, the initial introduction of microbial pathogens occurs most often during the surgical procedure performed in the Operating Theatre (OT), so it makes sense to assess this risk influenced by charatcteristics of the healthcare facility (amongst other charateristics) and by method of elimination, cut out all possible risks of harbouring pathogens including timber doors. A further advantage of most polymer doors is that the colour is evenly impregnated throughout the door meaning that the door maintains integrity and colour even with the toughest use and wear. The aesthetic feature, though not prescient in terms of maintaining hygiene is still a worthy consideration for any hospital that wants to provide the best facilities. The benefits of a polymer door with a high durability and insulative quality make it the better choice for hospitals looking to invest in their facility’s future. Speed is crucial in a hospital, where decisions need to be lightning fast and response times can be the difference between life and death. It is important that every part of the hospital is designed for optimal speed and efficiency while not compromising on hygiene or durability. The speed of a swing door depends on its weight, the resistance provided by the bearings, pressure and spring buffers on the door, and the force applied to open it. By keeping the weight to a minimum, you can immediately increase the speed at which it opens. Having the door on durable yet smooth mountings is another step. In fact many hospitals rely on a quad-action opening mechanism, where double-hinged frames allow the door to open through 180 degrees each way. This means that traffic is equally unimpeded regardless of its direction. To add to this, faster doors also mean less time for transfer of pathogens or other unwanted intruders through the doorway. In any building, a door’s seal is important; in a hospital even more so. A tight seal is essential for hygiene measures, to protect against, dust, insects and contaminants. It is crucial to have a seal that not only is airtight and resilient, but also in its construction, has very little space for harbourage of unwanted contaminants. The seal can be one of the places where build up is most likely to occur, particularly because it is the contact surface that rubs against the floor and ceiling but also because it is often made of rubber which is more susceptible to residue build up than both polymer and stainless steel. It is also important to make sure that your door is corrosion resistant, because corrosion will not only effect performance but also provide a perfect opportunity for contamination. This is largely the reason why companies use polymer and stainless steel for their hospital doors. The seal on other doors around the hospital including any roller doors to the external environment and should also be severely scrutinised. For further information, have a look here at how John Faulkner Private Hospital dealt with this issue. Not every hospital has the same layout or the same budget. Which is why it is important that the door you choose has a standard option and then offers particular features as add on's (keeping in mind that some add on's will preserve the life the door for longer; reducing maintenance costs down the line. So although you may be saving money right now by avoiding add on's, you may need to think about your maintenance budget in the future). Below are 6 key add ons you should be looking at. a) Spring Buffers: Spring buffers are pretensioned springs used to absorb impact and allow doors to open gently under stress. By using a spring buffer you give the door a reasonably uniform opening sequence regardless of the pressure being applied to it. You also preserve the door against heavier impacts. Options will often include both polymer and stainless steel Kick Plates. b) Mounting Options: Most swing doors will be offered with a normal mounting plate but should also have the option for a support frame, a frame designed for openings that don’t have the requisite strength to support the door and the traffic flowing through it. The support frame should easily fit to the inside of the doorframe to create a structurally sound framework. A well-designed support frame will come with bearings pre-mounted in the factory to ensure simple installation. c) Windows: Windows in hospital doors are crucial to know what is on the other side of the door, particularly when moving patients or fragile equipment, and all good swing door suppliers will offer you a range of windows for your door of choice; for example Remax Products offer window frames in black, yellow, white; the windows are available in clear, frosted or embedded with singnage; and double windows can be fitted per leaf. Preferably window choice will include double-glazed windows to assist with insulation. Good suppliers will also offer a window blind built into the glass of the window which provides privacy for Hospital Theatres when required but are sealed within the glass and will not harbour bacteria nor dust. d) Push Plates: Despite earlier mentioning that many hospital staff open the door in an unorthodox manner, it is still important to provide push plates to create an attractive focal point for entering personal. This encourages everyone to concentrate their contact with the door in one place, reducing grime to a single area that can be more easily cleaned. Consultants at Remax Products often suggest adding stainless steel push plates on lighter coloured doors for this reason. e) Kick Plates: Stainless steel / polymer kickplates assist with impact caused by trolleys / beds and pedestrian traffic while also maintaining the look of the door by helping to prevent scruffing on the door at foot level. Hopefully your doors already meet this design criteria. If you would like to learn more about the various traffic doors available for hospitals, please click here. 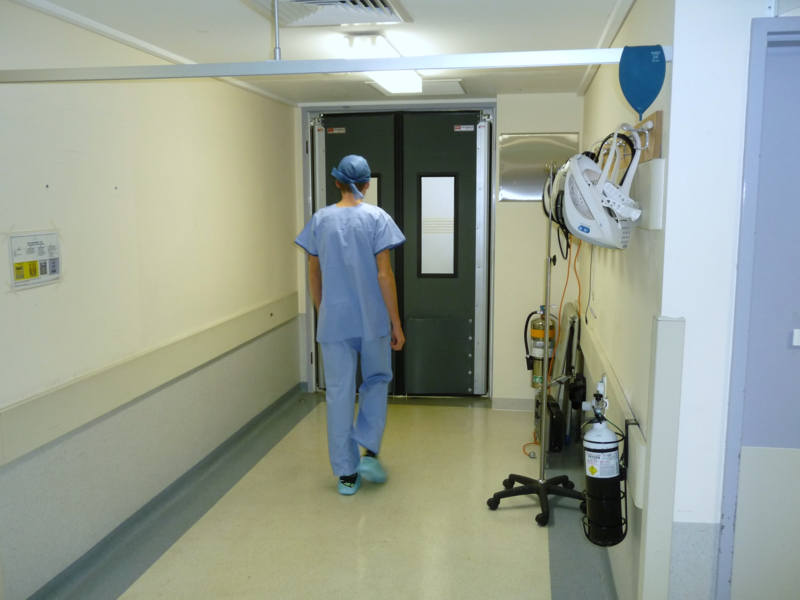 Or if you would like a closer look at the challenges St John of God, Ballarat Hospital faced and how their new doors adverted the potential closing of operating theatres, please click on the button below.